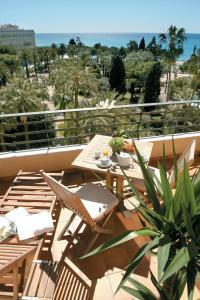 Located in the heart of Nice, this hotel overlooks the sea and is just a 3-minute walk from the Promenade des Anglais. It offers 4-star accommodation, a restaurant and 24-hour reception desk. The air-conditioned rooms at hotel Nice Plaza are equipped with satellite TV, a telephone, minibar and private bathroom. Internet access is available and some rooms have sea views. Plaza’s restaurant, La Terrasse, offers panoramic views and serves traditional French cuisine. During the winter, guests can relax with a drink in the hotel’s lounge bar or Plaz’Art cafe. B4 Nice Plaza is just 100 metres from the old town with its famous flower market. The international airport, Nice Cote d’Azur is only 7 km away.